MoMM 3/c Ralph E. Mashburn, son of Mr. and Mrs. F.E. mashburn, attended school in Hollister; husband fo the former Katherine Watson. 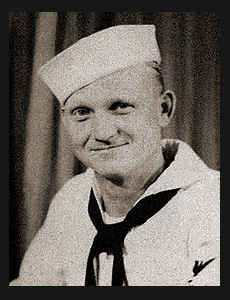 Entered Navy in April, 1944, trained in San Diego and Coronado, Cal. ; served in the Pacific; was wounded in Okinawa in April, 1945; medically discharged in Oct., 1945. Awarded Asiatic Pacific Ribbon with two Battle Stars, Am. Theatre Ribbon, Philippine Lib. Ribbon, Pres. Unit Citation.